Congratulation, you are getting Married! Planning your special day, you want everything to be perfect and to reflect your personality. I can help you come up with a wedding ceremony that will make a lovely, lasting memory. The location of your wedding ceremony could be a park, a loved one's home, garden, yard, deck, or church. You could even be married on the beach, at a state park, in a gazebo, a boat, or hotel. It is your choice. I can do your ceremonies just about anywhere. You can decide what works best for you. Whether there are several people witnessing your marriage vows or several hundred, you want it to be special. I am a non-denominational Ordained Minister, specializing in wedding ceremonies and vow renewals. 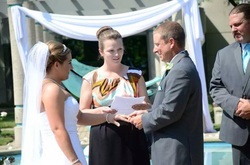 Performing inner-faith wedding ceremonies is one of my specialties. I am authorized to solemnize marriages in all counties of the state of Michigan and all other states. A standard wedding ceremony is always available or I can customize one from the many examples that I have. After you decide on the wedding ceremony, you will receive a copy of the wedding ceremony script before the big day. Whether or not you are planning to have a wedding rehearsal, it is useful to help with "staging." Once you have decided to use our wedding services, we will need a 100.00 deposit to hold your date. Summer dates fill up quickly. The balance is due before the ceremony. We reserve the right to change our fees at any time.